Co. Antrim: Armoy, Ballycastle (2), Ballintoy, Croagh, Cushendall (2), Cushleake, Dunsverick, Drumtullagh, Glendun, Glenmakeeran, Glenshesk, The Fair Head, Ramoan, Rathlin, Red Bay (2). The Board also included 5 ex officio Guardians, making a total of 23. The Guardians met each week on Tuesday. The site location and layout are shown on the 1909 OS map below. The population falling within the Union at the 1831 census had been 26,453 with divisions ranging in size from Glendun (population 872) to Cushendall (2,396) and Ballycastle itself (2,283). 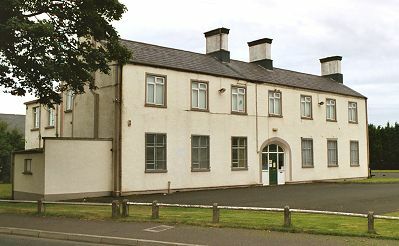 Designed by George Wilkinson, the new workhouse was built in 1841-2 on six-acre site to the west of Ballycastle and could accommodate 300 inmates. The cost of the building was £3,875 plus £812 for fixtures and fittings etc. It was declared fit for the admission of paupers on 3rd October 1842, and admitted its first inmates three months later on the 3rd January 1843. The workhouse lacked the typical two-storey entrance and administrative block. Instead, in a layout also found at Castlederg and Dunfanaghy, two small blocks flanked the site entrance at the east. These probably contained a porter's room, Guardians' board room, and reception wards. The main accommodation block had the Master's quarters at the centre, with male and female wings to each side. A central spine containing the chapel and dining-hall connected through to the infirmary and idiots' wards at the rear. During the famine in the mid-1840s, one of the fuel stores was converted into an additional day room and additional accommodation erected to accommodate and additional 30 inmates. A fever hospital to accommodate 40 patients was erected at the south-west of the workhouse. Ballycastle fever hospital from the south-east, 2003. At the 1901 census, the population of the Union was 12,686 with 10 officials and 75 inmates in the workhouse. In 1923, following the partition of Ireland, the workhouse became Dalriada District Hospital. The workhouse buildings have now all been demolished apart from the former fever hospital. Ballycastle former workhouse site from the east, 2003. Public Record Office of Northern Ireland, 2 Titanic Boulevard, Titanic Quarter, Belfast BT3 9HQ. Holdings include: Guardians' minute books (1892-1948); Dispensary minute books (1852-99); Workhouse registers (1843-1948); Indoor relief lists (1936-48); Indoor admission and discharge book (1935-51); Outward letters (1921-46); Master's journals (1891-1904); Record of officers (1867-1917); Contracts on boarded-out children (1912-39); etc.